Trevor and his lad Archie had booked a session with me to fish for chub and barbel on the Bristol Avon. So Sunday saw us meet up on the upper end of the river close to where they live. First we looked at the river and decided that it was worth putting in some hemp near to where a shoal of chub live via a bait dropper. First cast with the dropper saw a big tree branch jump out of thin air and lasso the line. Now where did that one come from. First cast and I hook a tree, now how does that look to Trevor and Archie? It decorated the tree like a christmas tree. I always carry a couple of the things just in case something like this happens. Soon we were set up with a running ledger and a hair rigged pellet. We didn’t need to wait too long before young Archie had his line pulled. It put up a really good fight in the fast flowing water. I must say he played it very well for his young years. At least the chub were feeding and I thought we stood a chance of a few more. Sure enough soon Trevor had one which went a little larger at 3lbs. So Dad was in the lead with the size of chub caught. We had tried floating crust but surprisingly none came up to investigate. I think it was too coloured and there was plenty of foam from the weir too. The river did look in good condition and it had risen a little since the previous days rain. Both Trevor and Archie had more bites but they were quite difficult to hook. We then decide to look at various swims downstream where some chub came for the crust but it was very difficult to fish. We cast into a few spots and had the odd fish but nothing large came along. We then decide to travel upstream in search of barbel. Sure enough when we reached the swim Archie and Trevor couldn’t believe the size of the barbel in the swim. It must have been about 9lbs and was flashing on it’s side and moving around the swim. So we dropped a bait onto some gravel and put a few free offerings. 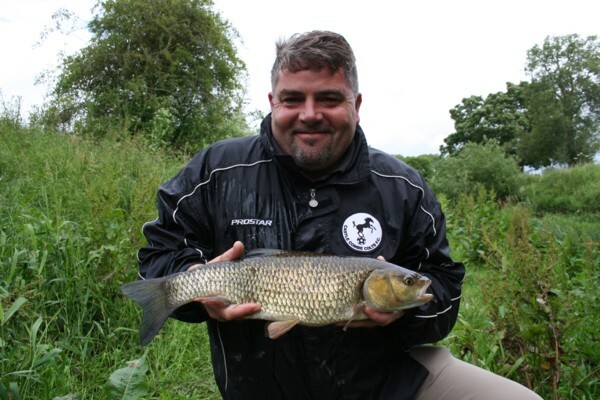 A small barbel came to feed then the larger one, then they disappeared not to return. I even put some hemp in. The only sight was a good size chub with a white head that fed. We walked further upstream and fished a pool that normally holds a good few chub. Both Archie and Trevor were touch ledgering with bread flake. Soon Archie was into a a nice rainbow trout. Then he had another and Trevor joined in the fun too. At one stage we had two trout in the net at the same time. So you can see they both had great fun touch ledgering. I suggested we leave the pool several times but Archie was having lots of fun hooking and playing these fish. Soon though we were back down the river fishing a nice little area that we called the jungle. It’s where there are a few branches in the water and we had lost a chub in there earlier. This time we had one bite that almost pulled the rod into the river but no hookup this time. We fished another pool where Archie caught another trout which he was now calling “pesky Trout”, he wanted chub. Now Archie was always asking questions why do this, why do that, he really wanted to know so much. I’ve got a feeling he will turn out to be very good angler. 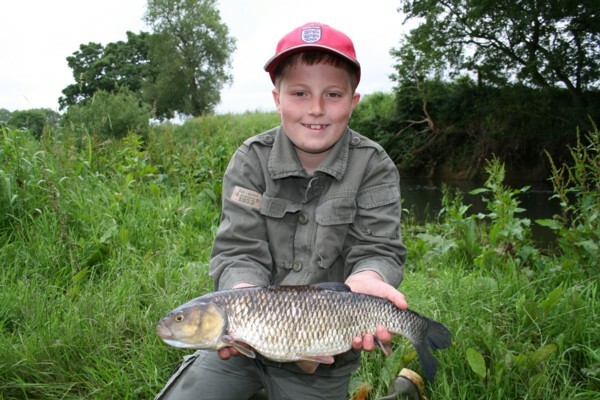 Our last hour was back fishing the original pool where Archie hooked and landed his pb chub of 3lbs 14oz. Have a look at the video of the days events. I think they enjoyed themselves. This is what Trevor had to say. Kenny – thank you so much for yesterday. Big Newman and Little Newman went away very, very happy. The photos are absolutely great and, I would think, will be decorating a certain young boys wall by the time he goes to sleep tonight! You are an absolute gentleman, generous to a fault and I thank you for answering Archies machine gun approach to questions with the patience you did. 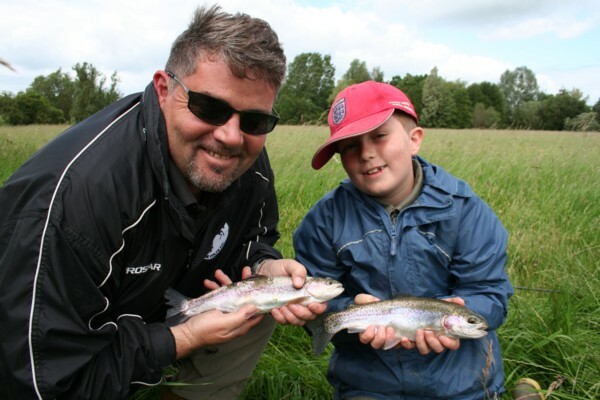 Answers from a professional angler carry 10x the weight of those from Dad. Is there anywhere you would like me to leave a testimonial? Looking forward – we have unfinished business with a barbel, tench tips to pick up and a Pike session to fit in! I see those being 3 seperate half days –spread over the next 12 months – any ideas?? This entry was posted on Wednesday, July 4th, 2012 at 8:16 pm	and is filed under Uncategorized. You can follow any responses to this entry through the RSS 2.0 feed. Both comments and pings are currently closed.